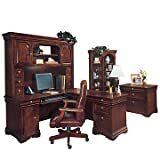 DMI Office Furniture Rue de Lyon Collection Executive Office Group is quality crafted with maple solids, select hardwood detailing and American cherry veneers, finished in a rich chocolate patina. This attractive collection features sophisticated Louis Philipe styling with shaped crown and base mouldings, picture frame door and drawer fronts, rounded top edges, and classic arch shaped details. Executive office grouping includes computer right L-desk, curio overhead storage hutch, two drawer lateral file, and double bookcase. Chocolate Patina Finish Executive Office Suite out of 5 based on ratings.